When anger and conflict are the problem, we're the SOLUTION! According to the National Safe Workplace Institute and the Bureau of Justice Statistics, anger in the workplace costs American businesses more than $4.2 BILLION annually including 111,000 violent incidents, 1.8 million lost work days and $55 MILLION in lost wages due to sick days and lost productivity. HOW MUCH IS ANGER COSTING YOUR COMPANY? For a modest investment, Pfeiffer Power Seminars, LLC, can dramatically reduce your losses and exponentially increase your profits. Enlightened companies know that increased productivity and profits occur when employees share a strong work ethic, mutual respect for one another and possess the necessary skills to work together collaboratively. Pfeiffer Power Seminars, LLC delivers those skills. Create a more cooperative and favorable work environment that converts wasted time into increased productivity and profits. Minimize lost performance time by turning contentious conflict into creative resolution. Reduce risk to employees by diffusing potentially explosive situations and dissention brought about by �fuel-injected� statements. Encourage confident, assertive behavior that builds mutual respect and cooperation which translates into company loyalty and dedication. Improve employee productivity by quickly clarifying issues and solutions that avoid blame and excuses. Open new lines of communication which judiciously resolve issues, boost moral and enable employees to work more proficiently as a team. Endorsed by Marci Shimoff, NY Times bestselling author of Happy for No Reason and coauthor of Chicken Soup for the Woman�s Soul. "All books of wisdom are meant to be read more than once. This is one such book." 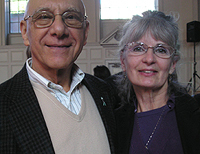 - Dr. Bernie Siegel, NY Times bestselling author, world-renowned medical doctor and mind, body, spirit leader. Pfeiffer Power Seminars, LLC is dedicated to helping non profits raise funds. Call us to discuss how we can help. Click here for Calendar of Speaking Engagements. Janet Pfeiffer on Facebook: "Heal our World"